Plastic Caps, Taps, Tops, Tamper Evident, Child Proof, Bottles, Jerry Cans, Wheels. Injection and Blow Moulding Molding Plastic. EPI Plastics New Zealand are manufacturers and distributors of a wide range of caps. Including Tops, Tamper Evident Caps, Tap Caps, Closures, Components, Plasterers Caps, 58mm Jerry Cans, Sprayers, Triggers, Child Resistant and Proof Caps, Pumps, Bungs (20mm, 24mm, 28mm, 38mm 400, 410 and 415) and Injection & Blow Moulding Plastic Wheels. Cap - 58mm 20 Litre Jerry Can Black Cap. This is the bung tap that fits in the bottom of our 20L Jerry Can. Excellent for tightening 58mm caps or getting them off. Also useful for the bung at the bottom. Extra caps if sold separately. Advanced aeroflow design that allows air in and similtaneous liquid out. Usually sold in boxes of 460, but we can sell less. Available in a variety of colours. Generally we keep black, yellow, red, green, blue and orange in stock. We can supply other colours but a the minimum purchase is 460 and lead times apply. For our 10L & 20L jerrycans (and other popular brands). Includes a dustcap and washer/gaskets to prevent leaks. Approx 220mm in height. Includes an internal rubber washer gasket to prevent leaks. Allows air in and liquid out. An economical alternative to our other tap cap (see below). Fits our 10L and 20L (and many other popular brands). Tap can also screw into the bottom of the can. Very versatile. 58mm Cap with 3/4" BSP Thread Bung Fitted. Red cap with black prefitted bung. Screws on top of our (and many others) 10L and 20L jerrycans. Our 58mm caps are prefitted with this rubber washer to prevent leaks. However, you are able to buy more to replace any you may have lost. Usually sold in boxes of 460, but we can sell less. Other colours avaialble MOQ 460 and lead times apply. Bung - 20 Litre Jerry Can, BSP Thread 3/4"
Child Resistant Cap for 38mm 410 Bottles. Extra caps if sold separately. Huge variety of stock colours manufactured by us. For bottles. 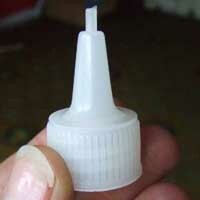 Snip the end off which then forms a hole so that product can be dispensed. This cap is for our 4L and 5L jerrycans and 2L standard bottles. Available in white, black, red and blue.